The RNLI Lifeboat Jetty is located on the western side of the River Rother in Rye Harbour, adjacent to the RNLI Lifeboat Station slipway. It is mainly used by small leisure craft such as dinghies and speedboats, but also by general boaters including fishermen. Constructed from timber, the jetty refurbishment included an extension of approx 20m together with a new high level walkway back to the shoreline. This provided essential additional mooring space for leisure craft at peak summer times and more reliable access at all states of tide. • Supply and installation of all hardwood members, walkways, access steps and platforms, ladders and associated components, rubber fenders and mooring rings. The site was limited to 6m into the river from the front of the existing RNLI Jetty to minimise the impact on navigation along the main channel. We used land-based working methods to minimise impacts on river navigation. The project was located adjacent to the mudflats, saltmarsh and area surrounding the harbour which are within a SSSI (Site of Specific Scientific Interest). 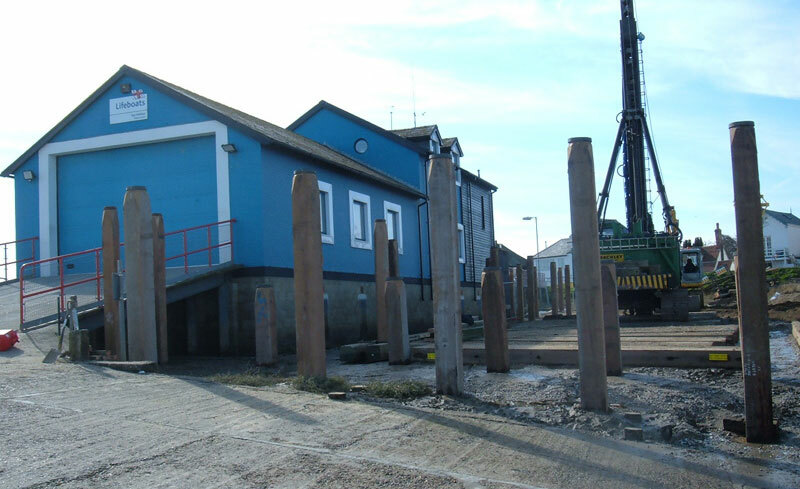 It was also located on the premises of the RNLI Lifeboat Station, and access was required at all times for the lifeboat to the adjacent slipway.